There is emerging evidence that insurers are increasingly interconnected to the broader financial system. As linkages within and across banks, broker/dealers, hedge funds, and insurers have grown over time (Billio et al. 2012), we have also witnessed a significant transformation of the life insurer’s business model – large life insurers, both in the US and in Europe, have significantly expanded the supply of investment products known as variable annuities with guarantees (Koijen and Yogo 2017, 2018). As Figure 1 shows, US life insurers are now relatively less likely to be involved in the traditional insurance business, where an insurer underwrites idiosyncratic risks and invests in accordance with an asset-liability matching principle. Under this model, insurers can take a long-term investment perspective, and potentially act as asset insulators by providing liquidity during periods of market stress (Chodorow-Reich et al. 2016, The Geneva Association 2015, 2016, Thimann 2014). In sharp contrast, with the significant emergence of variable annuities, insurers’ asset allocations have become more procyclical, less diverse across insurers (Bank of England 2014, ESRB 2015), and more exposed to overall equity market fluctuations. One major concern among regulators is that the overall insurance sector’s exposure to aggregate risk – in particular duration risk and interest rate sensitivity – has been growing (EIOPA 2017, GA 2015, IMF 2016). Finally, we also observe elevated stock price co-movement among insurers as a consequence of this evolution. Source: American Council of Life Insurers, 2015 Life Insurers Fact Book, and Alejandro Drexler, Zain Mohey-Deen, Richard Rosen. Systemic risk analysis has largely focused on the linkages among financial institutions’ funding arrangements, and the increasing connections along these lines between insurers and the remainder of the financial system deserves appropriate scrutiny. However, commonality in financial institutions’ assets is equally important. Yet, the asset side as a source of vulnerability has received relatively less attention, perhaps because of a lack of data and/or a proper environment to test this channel. The insurance sector data are excellent, and the risk implications of the evolution of insurers’ asset allocations associated with their variable annuity business are potentially important. In our recent paper, we focus on this channel and show how systemic risk can originate from the insurers’ business model, in which they provide embedded equity-linked investment guarantees (Ellul et al. 2018). We describe a mechanism that explains how financial institutions’ exposures to financial guarantees on stock market performance create incentives to reach for yield by overweighting similar, illiquid assets. In the case of a period characterised by equity market stress, an individual insurance company may be forced to sell its assets to regain financial health and meet regulatory thresholds. In doing so, however, it will impose externalities on other institutions – not only insurers – holding similar assets. Contagion will result and systemic risk emerges. Our main finding confirms the maintained hypothesis – insurers’ collective allocation to illiquid bonds, exacerbated by the reaching-for-yield behaviour of the last decade (which was characterised by low interest rates), amplifies system-wide fire-sales in the event of negative asset shocks. Under different scenarios, these dynamics can plausibly erase up to 20–70% of insurers’ aggregate equity capital. From the perspective of an insurer, a variable annuity policy is a combination of business lines related to asset management and life insurance. An insurer allocates policyholder savings to a separate account and acts as a delegated asset manager of policyholders’ funds. Absent any guarantees, the separate account is a pass-through account in which a policyholder bears all investment risk. Once a policyholder reaches retirement age, she has an option to convert funds to an annuity which protects against outliving savings in retirement. This exposes the insurer to (traditional) longevity risk. The presence of guarantees, however, turns variable annuities into stock market put option-like instruments. As a result, insurers now bear significant market tail risk. That is, exposures to guarantees are at their peak during a severe market downturn, exposing insurers to losses at the most turbulent times. To safeguard annuity investors, capital regulation forces insurers to set aside reserves associated with any guarantees they have written. The size of the reserves associated with guarantees, now among the largest liabilities on insurers’ balance sheets, fluctuates with stock market performance and interest rates. Figure 2 plots the evolution of the insurers’ gross reserves to capital ratio for the period from 2004 to 2013. It reveals the high volatility of the ratio for insurers with high exposure to guarantees, with spikes around the global financial and European sovereign debt crises. Note: This figure plots the time series of the ratio of gross reserve to capital for the period from 2004 to 2013. Each year, life insurers with VA are divided into two groups by the ratio of gross reserve to capital. The ‘high’ (‘low’) group includes life insurers with ratio of gross reserve to capital higher than (less than or equal to) the median. The annual averages across life insurers in each group are plotted—the solid (dashed) line representing the high (low) group. 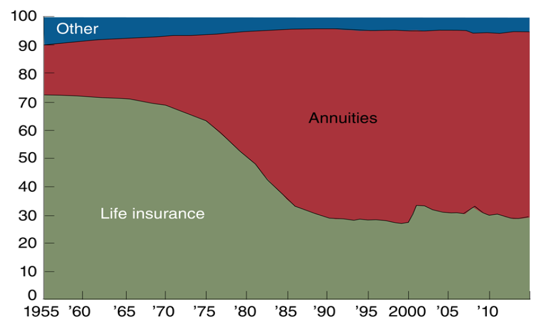 For comparison, the annual averages for life insurers without a variable annuity are also plotted (solid line with square markers). Only life insurers that have averaged total assets greater than the fifth percentile of the sample of life insurers with VA are included. To reduce the exposure to guarantees and the associated fluctuations of reserves, insurers hedge their exposure to the stock market. As markets for long-term put options are incomplete, outright hedging of the exposures is not feasible. Instead, insurers employ delta-hedging – that is, short selling equities and investing the proceeds in bonds. This type of hedging has two implications for insurers’ portfolio allocations subject to regulatory capital requirement. First, it tilts the asset allocation to holding more bonds. Second, insurers are incentivised to hold a higher share of illiquid bonds in their bond portfolios. This overweight allows the insurer to earn a higher return that, absent the delta-hedging of guarantees, would have been obtained from investing in stocks. In other words, hedging of guarantees creates incentives to reach for yield within the bond portfolio. Calibrating our model using the regulatory filings data collected by the National Association of Insurance Commissioners confirms its key implications. 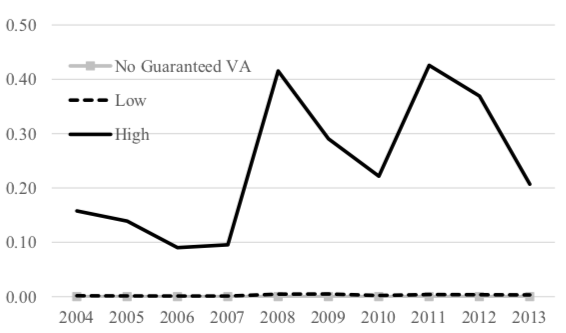 We find that insurers that underwrite a substantial amount of variable annuities with guarantees (and delta-hedge their exposures) disproportionately tilt their portfolios towards higher yielding illiquid bonds. Assessing the quantitative impact of various market shocks on insurers, we demonstrate that negative shocks to the equity market of 10-40% would result in insurers selling $114-$458 billion of illiquid bonds, with the corresponding system-wide fire sale costs representing up to 21% of insurers' total equity capital. If the stock market shock is also correlated with the shock to illiquid bonds themselves, as was the case during the financial crisis, the fire-sale costs will be amplified due to a fire-sale externality. A 40% shock to the equity market combined with an 8% shock to illiquid bonds would generate fire-sale costs that erase up to 89% of insurers' capital. Interestingly, we find that the largest culprit of ex post systemic risk is the ex ante reaching for yield behaviour, rather than the net variable annuity guarantee exposures per se. The overweight towards illiquid assets in the bond portfolio is a central component of the story. The relevance of our results extends beyond the insurance sector. While the exact transmission mechanism will depend on institutional details, our analysis helps to shed light on the incentives and consequences of other guarantees that are pervasive throughout the financial system. For example, defined benefit pension funds also provide various guarantees and share a degree of under-fundedness, both of which provide incentives for these funds to reach for yield. Likewise, the guarantees that banks provide to outside investors in securitisation deals resemble those embedded in variable annuities. While data limitations on pension funds and banks make it impossible to comprehensively analyse the impact of guarantees of those other important intermediaries, our analysis makes an important contribution to a broader literature on the link between the incentives associated with guarantees and systemic risk. Insurance regulation has traditionally put little emphasis on systemic risk, consistent with the idiosyncratic nature of insurance liabilities. Following the expansion of the life insurance industry into asset management, insurers are now more likely to contribute to systemic risk through correlated fire-sales of illiquid bonds. It implies that regulators need to put more prominence on developing appropriate liquidity monitoring tools and liquidity regulation. Acharya, V and T Yorulmazer (20070, “Too many to fail: An analysis of time-inconsistency in bank closure policies”, Journal of Financial Intermediation 16(1): 1–31. Acharya, V and T Yorulmazer (2008), “Information contagion and bank herding”, Journal of Money, Credit and Banking 40(1): 215–231. Bank of England (2014), “Procyclicality and structural trends in investment allocation by insurance companies and pension funds”, Discussion paper. Billio, M, M Getmansky, A W Lo and L Pelizzon (2012), “Econometric measures of connectedness and systemic risk in the finance and insurance sectors”, Journal of Financial Economics 104: 535–559. Chodorow-Reich, G, A Ghent and V Haddad (2016), “Asset insulators”, working paper. Drexler, A H, Z Mohey-Deen and R J Rosen (2017), “Rules and discretion in life insurance regulation”, Chicago Fed Letters 373. Ellul, A, C Jotikasthira, A Kartasheva, C Lundblad and W Wagner (2018) “Insurers as asset managers and systemic risk”, CEPR Discussion Paper 12849. Ellul, A, C Jotikasthira and C T Lundblad (2011), “Regulatory pressure and fire sales in the corporate bond market”, Journal of Financial Economics 101: 596–620. European Systemic Risk Board (ESRB) (2015), “Report on systemic risks in the EU insurance sector”. European Insurance and Occupational Pensions Authority (EIOPA) (2017), “Systemic risk and macroprudential policy in insurance”. Greenwood, R, A Landier and D Thesmar (2015), “Vulnerable banks”, Journal of Financial Economics 115: 471–485. International Monetary fund (IMF) (2016), “April 2016 Global Financial Stability Report, Chapter 3: The insurance sector – Trends and systemic risk implications”. Koijen, R S J and M Yogo (2018), “The fragility of market risk insurance”, Working Paper. Koijen, R S J and M Yogo (2017), “Risk of life insurers: Recent trends and transmission mechanisms”, Working Paper. The Geneva Association (2015), “The impact of low interest rates on the insurance sector and its economic role”, Research report by Daniel M Hofmann. The Geneva Association (2016), “Insurance sector investments and their impact on financial stability”, an empirical study, by Anna Maria D’Hulster and Daniel M Hofmann. Thimann, C (2014), “How insurers differ from banks: Implications for systemic regulation”, VoxEU.org, 17 October. Wagner, W (2011), “Systemic liquidation risk and the diversity–diversification trade-off”, Journal of Finance 66(4): 1141–1175.